This young adult novel raises questions about who is sane and who is disturbed. Stephen's mother has been locked away in a mental hospital. He and his father move to Spencer, a tiny town in the middle of nowhere, moving in with Stephen's bitter grandmother. His father never stands up for himself or Stephen, but just gives in to his own mother's many demands. Stephen meets people in town, hoping to make friends. But he is struck how backwards-thinking they are, and how difficult it is to fit in with the local teens. The two people who he finds himself interested in are brother and sister Devon and Cara. Their father has recently died, and he can empathize with them. But they are both trouble-makers. Devon leads a band of other teens, hanging out in the local cemetery, hatching plans and smoking clove cigarettes. They also seem to have supernatural powers. Cara is estranged from her brother, but is ready to make friends with Stephen; in fact, she is extremely attractive and seems ready to get into a relationship with him. But many people in town warn Stephen against the brother and sister, and they do seem to dice with danger. As Stephen finds out more, he clashes with most of the important people in his life, and he is increasingly isolated. 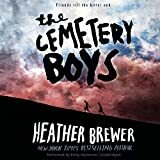 The Cemetery Boys has many elements of supernatural thrillers, and has many of the excesses of drama and symbolism that plague that genre. But Brewer manages to raise her novel a bit above the hundreds of the books of magic and vampires that are so popular in young teen fiction. While the book raises interesting questions, its treatment of mental illness is problematic. Its depiction of psychosis is stereotyped and stigmatizing. The crazy people are scheming and evil. The topic of when it is OK to lock people up because they are mentally ill is not explored carefully. It might be a bit much to expect a teen novel to go into all the difficulties involved in that kind of decision-making, but it could be a bit less simplistic. Kirby Heyborne performs the unabridged audiobook and brings to it plenty of exclamation and drama in his reading. It is rather heavy handed, but it keeps the implausible plot moving along.